But... what would Rachel think? Former "Friends" star David Schwimmer apparently has an evil twin overseas wrecking the reasonably good name of his television alter ego Ross Geller. The Blackpool police in Northwest England posted a Facebook post of a man sought in the theft at a local restaurant last month. And lets just say... the guy looked more than a little familiar to fans of the former NBC hit show. I laughed so hard. 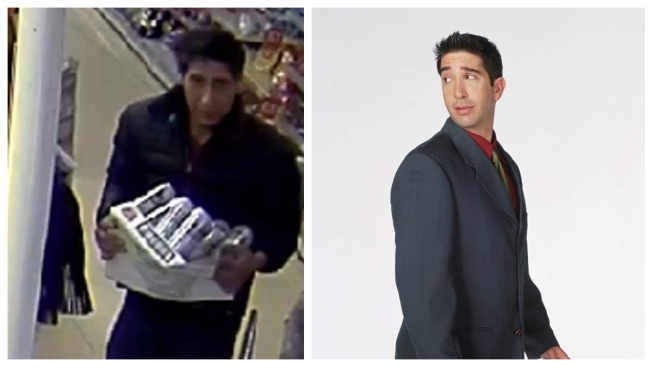 Not because Ross's doppelganger stole beer, but that the police actually announced that @DavidSchwimmer was in New York. "Do you recognize this man? We want to speak to him in relation to a theft at a Blackpool restaurant on the 20th September. If you know who this is, please email 7798@lancashire.pnn.police," the police wrote. And for those of you wondering, the Blackpool police officially cleared Ross Schwimmer of any wrongdoing. "Thank you to everyone for your speedy responses. We have investigated this matter thoroughly and have confirmed that David Schwimmer was in America on this date. We're so sorry it has to be this way," they wrote. Schwimmer got in on the joke himself late Wednesday, offering up his own alibi video. If anyone spots the doppelgänger call the police.... or Jennifer Aniston.